5 years ago this month, the Jewish world was shaken by the horrible tragedy that struck the 2 young daughters of Michal and Shimon Gross, who died after an exterminator sprayed poison in their home. The Grosses’ 2 sons, who were also poisoned, were rushed to the hospital in critical condition. 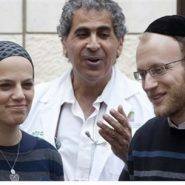 B”H, both boys miraculously experienced full recoveries and since the tragedy, the Grosses have been blessed with 2 more children, a son born a year after the tragedy and a daughter, who is almost 2 years old. After the tragedy, we returned home, a family crushed, with 2 sons, without the girls. There was a tremendous void. We needed to come to collect together all the broken pieces. But slowly, slowly, stage by stage, we made progress. There are always setbacks, memory hurts, there is longing, but time heals. The pain isn’t as thick today as it was in the beginning. Interviewer: What helped you after the tragedy? The first thing that helped was that in the beginning, we received support from every direction. Our family supported us. The Jewish people embraced us and carried this heavy burden along with us in every respect: physically, emotionally, spiritually. People sent toys, treats, letters from all over the world. [CJW: Michal Gross said at the time that she received special encouragement from the many letters sent to her by you JewishMOM.com readers]. We also received a lot of encouragement from great rabbis and rebbes who came to comfort us and knew exactly the right words to say. We felt like we were in a pit, in a chasm, in complete darkness. From being a lively, bubbling family we had been altered from one moment to the next into a pitiful, grieving family. A sad family. One of the rabbis who came to comfort us told us, “You will enjoy abundance in the future. Don’t worry, you will have a happy family. It will be OK.” I so needed to hear that. Because I feared that the sadness and mourning would always be present, and wouldn’t let us live. But time does help. Hashem did a great kindness for us, and has truly brought us abundance. Since the tragedy, a son was born to us, today he is 4. As well as a daughter who is almost 2. Even though this doesn’t bring back what was lost, there’s no doubt that it does help fill the void. I don’t know how it’s possible to survive this pain without that. Interviewer: Do you feel that the tragedy made you grow? That you changed? Very much so. My life was completely normal. Home, work, children, my life was passing by me. Today I feel that life is within me. I have a very strong feeling of being present. A desire to take advantage of every moment with family. I feel a great deal of gratitude for what is. Nothing should be taken for granted. Instead of looking at what is lacking, there is a lot of looking at what is. My mothering has become more present. There isn’t that desire to leave the home; the home fills me up inside. I feel that this tragedy elevated us, and brought strengths out of us that we didn’t know existed. It’s not that the difficulty has disappeared, the pain still exists. But today we appreciate much more what we do have. Interviewer: Do you have words of encouragement for women coping with life’s daily challenges? And together with that challenge, Hashem brings us special strength to cope. With each portion of a challenge we receive a portion of strength. We need to pray and utilize those strengths and abilities to overcome the challenges, with G-d’s help. May Hashem bless the Gross family from now on with abundance! With happy events and joy and nachas from all their children! This is so inspiring, reminding us to be “present” and remain grateful for our normal family lives. Just wanted to saw that I really needed this…I am going through a challenge that isn’t so big in the scheme of things, but is rough right now, and it often seems like Hashem got the “wrong address” (love that!) Thanks for the inspiration. sorry to hear that you are going through a hard time, but happy this helped! This what it means to think like a Jew!